Newly-promoted French club AS Monaco have completed the signing of Radamel Falcao from Atlético Madrid for a reported fee of €60 million. Falcao was believed to be a target for Europe's top clubs, with Real Madrid, Chelsea, Manchester United and Manchester City had all been linked with a move for the Colombian striker. However, Monaco's wealthy Russian owner Dmitry Rybolovlev has whipped out his cheque book and added one of the world's most sought-after strikers to their books. No details of the fee have been made public, but it is believed to be worth around €60 million with Falcao set to earn annual salary of around €14 million for the next five years. 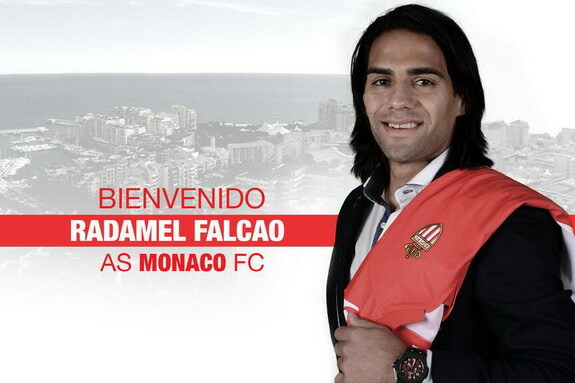 "AS Monaco FC is delighted to announce that it has reached an agreement with Atlético Madrid and the player Radamel Falcao for his transfer to ASMFC, effective as of the 2013-2014 season," read a statement on Monaco's official website. "Radamel Falcao García Zárate, the Colombian international forward, has signed a 5 year contract. The player will be introduced to the media in the course of pre-season training, at a future date to be confirmed by the club. Rybolovlev also offered comment: "We are absolutely delighted that Radamel Falcao has accepted the challenge of coming to play for AS Monaco FC. "We are proud to have secured one of the best players in the world and confident that he will help ASMFC regain its rightful status." The transfer brings to a close a two-year spell at the Vicente Calderón, during which time the 27-year-old scored 70 goals in 90 appearances for Los Rojiblancos. "From Atlético Madrid we wish him luck in his new home and thank him for the great demonstration of professionalism that he has shown in the two seasons he played for our club," a statement said on Atléti's website. The newly-promoted club are hoping to challenge for the French title next season and are flexing their muscles in the transfer market, thanks to billionaire owner Rybolovlev. Last week, they signed FC Porto pair of João Moutinho and James Rodríguez in a €70 million deal. That means the principality club have forked out a whopping €130 million before the transfer window even opened.